Please read these conditions carefully before using the Keith Singleton Horticulture website. By using this website, you signify your agreement to be bound by these conditions..
Customers or visitors to this web site are referred to as "you" . 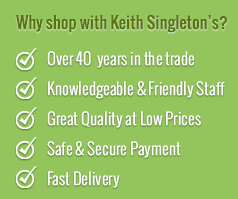 Keith Singleton Horticulture are referred to as "us" or "we". You can pay by most major credit and debit cards. Your details will be encrypted to keep them secure. Once your card details have been processed by PayPal, you will be able to view an onscreen confirmation that your order process is completed and you will also receive an email invoice confirming your order. Additionally, you will also be able to login to your Lakeland Shootimg Supplies account to view and check the status of your order. When you place an order to purchase a product we will send you an e-mail confirming receipt of your order and containing the details of your order including transaction and order reference numbers. Your order represents an offer to us to purchase a product, which is accepted by us when we process payment for your order. When we accept your order, we will send a Despatch Confirmation E-mail. Any products on the same order which we have not confirmed in a Despatch Confirmation E-mail to have been despatched do not form part of that contract. If you have incorrectly entered your email address your confirmation and despatch email will fail. So long as payment has been processed successfully this will in no way affect your order. Failure by us to send a receipt confirmation email or despatch confirmation email in no way invalidates your offer or our acceptance of your offer. In the event that your goods are damaged in transit, please contact us within 24 hours of receipt. If you fail to do this, or if goods have been signed for as received in good condition, we may not be able to offer a refund. When ordering goods from us for delivery overseas you may be subject to import duties and taxes, which are levied once the package reaches the specified destination. Any additional charges for customs clearance must be borne by you; we have no control over these charges and cannot predict what they may be. If a package arrives in a damaged condition, do not open it, but immediately ask the delivery firm to return the package, and please inform us immediately. Product prices include VAT at 20.00%. When you make a purchase we need to collect certain information to process your transaction and fulfil your order. We do not sell, rent or disseminate this information to any third party for marketing or any other purposes. Our graphics, logos, page headers, button icons, scripts and service names are the trademarks or trade dress of Keith Singleton Horticulture, and may not be used in connection with any product or service without our written authorisation. We grant you a limited licence to access and make personal use of this website, but not to download (other than page caching) or modify it, or any portion of it, except with express written consent from us.